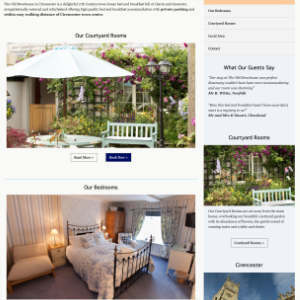 At Cirencester Web Design we don't just build new websites for clients, we also re-design sites which have been created by other companies. Many businesses will have had a website for years. Over this time the site may look more and more dated as designs change and the internet develops. "But I'll just go back to the original web designer for my website re-design" you might be saying. Well that's always an option assuming, of course, that they are still trading! Over the years we have been in the industry we have seen website design businesses come and go. In fact, we have formed many new business relationships with companies who have a website which was created by a web designer or website design company which has ceased trading. We have been creating websites for over 10 years. This is our main business. We are not a graphics design company who have tried to tap into the internet market. We are not a start-up. We are an established comapny with years of experience and a solid customer base. So if you are looking to re-design your website, please contact us so that we can discuss your requirements.